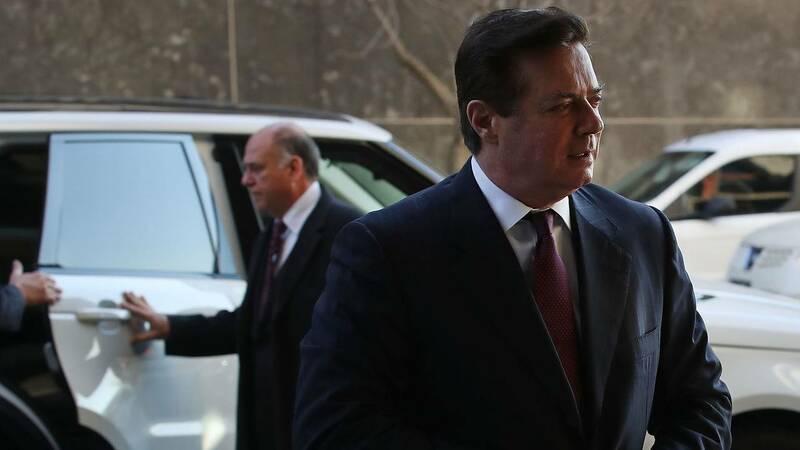 Former Trump campaign manager Paul Manafort arrives for a bail hearing at the Prettyman Federal Courthouse in Washington, DC. (CNN) - Paul Manafort, the former Trump campaign chairman indicted on money laundering and other charges, filed a lawsuit challenging the broad authority of special counsel Robert Mueller and alleging the Justice Department violated the law in appointing Mueller. The suit brought Wednesday in US District Court in Washington, where Manafort and another former Trump campaign aide are charged, challenges Mueller's decision to charge Manafort with alleged crimes that they say have nothing to do with the 2016 campaign, but rather relate to lucrative lobbying work Manafort and his deputy did for a former Russia-friendly government in Ukraine. That work ended in 2014, the suit says. Manafort and his deputy Rick Gates deny the allegations in the charges. The legal action represents a new tack in a broader effort by supporters of the President to push back on the special counsel. Some Republicans have begun publicly calling for Mueller's probe to be shut down. Manafort's attorneys have echoed the President's criticism that Mueller's investigation into Russian meddling in the 2016 election is pursuing crimes that never happened. The Manafort lawsuit alleges Deputy Attorney General Rod Rosenstein and Mueller have unlawfully exceeded the authorities allowed under the law governing special counsel appointments. The lawsuit contends that the order Rosenstein signed to appoint Mueller "exceeds the scope of Mr. Rosenstein's authority to appoint special counsel as well as specific restrictions on the scope of such appointments." A DOJ spokesperson responded with a statement, saying: "The lawsuit is frivolous but the defendant is entitled to file whatever he wants." The lawsuit also includes new information on the scope of Mueller's probe: In August, the Mueller prosecutors issued more than 100 subpoenas related to Manafort, the lawsuit alleges. Some of those subpoenas seek records from as early as 2005. In August, a prosecutor from Mueller's office told Manafort that he'd be prosecuted for alleged crimes dating back to 2010, the complaint says. When Manafort's lawyers asked Rosenstein in fall 2017 for clarification on whether Mueller's team had the go-ahead to broaden the investigation into earlier years, they heard nothing back, the complaint says. Manafort's indictment includes actions he took from 2006 to 2014. In previous court filings, prosecutors said they've collected 400,000 documents related to Manafort and Gates' case, and identified 2,000 of those documents as especially relevant. The lawsuit's focus is on a part of the Rosenstein order that says that Mueller may investigate "any matters that arose or may arise directly from the investigation." The Manafort lawyers say that goes beyond what the law allows Rosenstein to empower Mueller to do. The Rosenstein order gives Mueller "carte blanche to investigate and pursue criminal charges in connection with anything he stumbles across while investigating, no matter how remote from the specific matter identified as the subject of the appointment order," the lawsuit says. The Manafort lawsuit alleges that even if Rosenstein's order is lawful, Mueller has exceeded his authority. It also says that Manafort met in 2014 with the Justice Department and the FBI in the government's investigation of his client, former Ukrainian President Viktor Yanukovych, ousted amid street protests that year. The Manafort suit claims the government told Manafort he was a witness in the investigation. The special counsel has now charged Manafort with conduct he had already voluntarily disclosed, the lawsuit says. Manafort "voluntarily met with DOJ prosecutors and FBI agents to discuss his offshore political consulting activities" in July 2014, the complaint says. At that time, the Justice Department told him they were working with Ukraine to locate stolen assets and focused on a former Ukrainian president, according to the complaint. "The office of the special counsel charged Mr. Manafort with the very conduct he voluntarily disclosed to DOJ almost three years prior to the appointment of Mr. Mueller as special counsel," the complaint says. Manafort's lawsuit notes that during his time working for the Ukrainian government he met regularly with the US ambassador in Kiev, suggesting that the US government knew what he was doing at the time. The suit also cites the July FBI raid on Manafort's home, in which the special counsel team said it was seeking records of possible financial crimes dating to January 2006 -- a decade before the presidential campaign Mueller is investigating.